ClickStrip software is a perfect way for small offices and clinics to enjoy the benefits of high density filing with minimal labor and cost. The easy-to-use software prints all of your file information on a single label strip using your desktop color printer. The labels are quickly applied to folders in one easy step. If you currently use a multiple label system, ClickStrip can match your colors and design. More than 20 of the most popular alphabetic and numeric indexing systems are preset, including Smead, Tab, Jeter, Barkley and others. Just enter your data and click to print. The ClickStrip Singles form is designed to feed into desktop color printers like an envelope. Simply adjust your feed tray to envelope size and fill with forms. The 8-inch label has plenty of room for file headings, bar codes and several color coded bands. Bar codes can be generated on labels for automatic tracking using document management software such as Smeadkink or Imagetrax. You determine the starting number and ClickStrip generates bar codes in sequence as you key in your data. ClickStrip software also saves a log of all of your label data for future export into document management software. ClickStrip comes with more than 20 typical label designs for alphabetic and numeric color coding systems. As a single-user application, ClickStrip Software for Windows is the low cost way to begin using time-saving filing techniques such as color coding and shelf filing, while laying the groundwork for a more sophisticated filing system using bar code recognition and document management software. Conveniently sized forms feed into printer at standard envelope settings. Print color coded letters or numbers to match any popular labeling system. Unique alignment contours line up with standard end tab folder tabs for precise label positions. 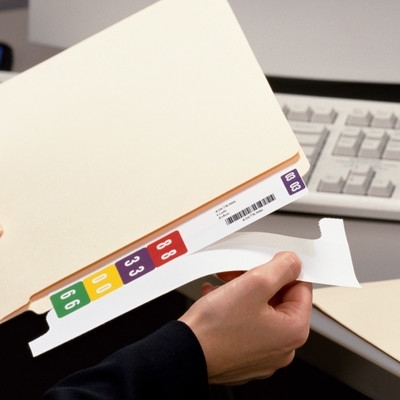 Exclusive ColorFit system aligns label perfectly to ColorBar Folders. Print names, addresses, account numbers, or any text on both sides of the label for quick identification. Automatically generate bar codes for electronic tracking using document management software. Print color coded year codes or color bands that indicate specific types of files.